Hard work rewarded as Fiona McLean wins World Masters bronze. Fiona McLean secured a bronze medal at the 2018 WSF World Masters Championships to make it double delight for Scotland at the tournament in Charlottesville, USA. Ian Ross won silver in the Men’s O70s category whilst Fiona claimed third place in the Women’s O55s competition held at the highly rated McArthur Squash Centre earlier this month. Fiona produced a strong performance to reach the semi-finals of the Women’s O55s event and secured her bronze medal courtesy of a comeback win over Aussie Sue Williams in their 3/4 play-off, 9-11, 7-11, 11-7, 11-6, 11-7. In the final, top seed Susan Hillier (AUS) beat Fiona’s last four opponent Mandy Atkin (ENG) in three games. 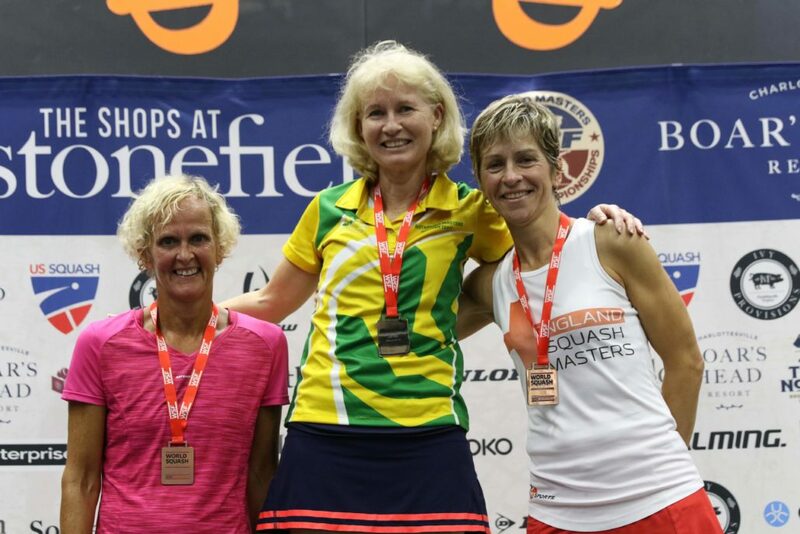 Fiona’s success continues her recent good form having defended the British O55s title in June and means she betters her previous best World Masters result when she reached the O50s quarter-finals in Birmingham six years ago. Fiona, above left, is on court five times a week and believes her fitness was key to her sealing world bronze. She said: “The 3rd/4th match was a real battle against Australian Sue Williams. “She was a good player, fast around court and took the first two games. “I just managed to hang on in and drag it back. “I am pretty fit and a lot of my wins are probably down to fitness. The Newbury-based player continued: “I’m on the court five times a week and tend to play matches rather than do drills. Born in Bellshill near Glasgow, Fiona, who won the European O55 Masters title last year, moved to England when she was five but enjoys every opportunity to pull on the Scottish jersey. “I love the team environment we have,” the 56-year-old said. “There was a great team spirit when we were out in Charlottesville. “People got together and supported each other in the matches. “I like the camaraderie and competition and these kind of events are great. 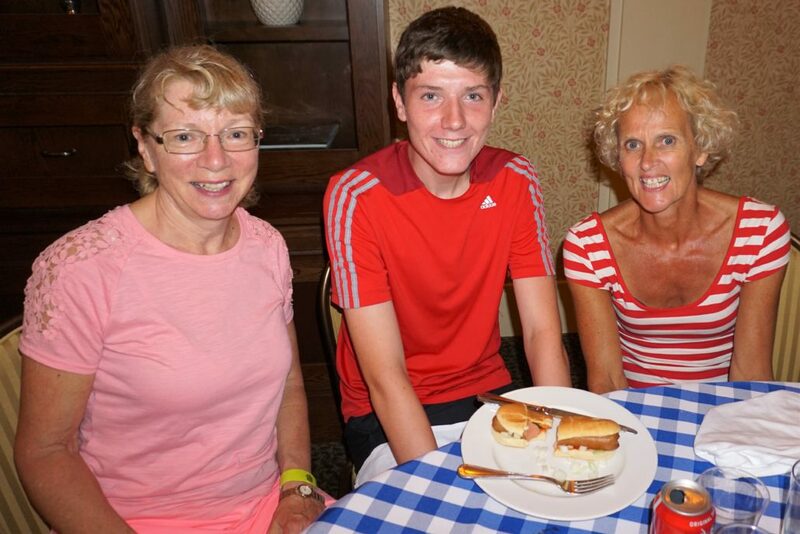 “I was out in the USA for a month, you can go on holiday, meet lots of people and play squash. It’s great fun. 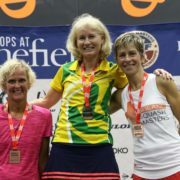 “I started playing squash in my late 20s. “It seems a long time now but I was late coming into the sport. She added: “This year’s venue in Charlottesville was fantastic, the courts were great and it was a very well run event. 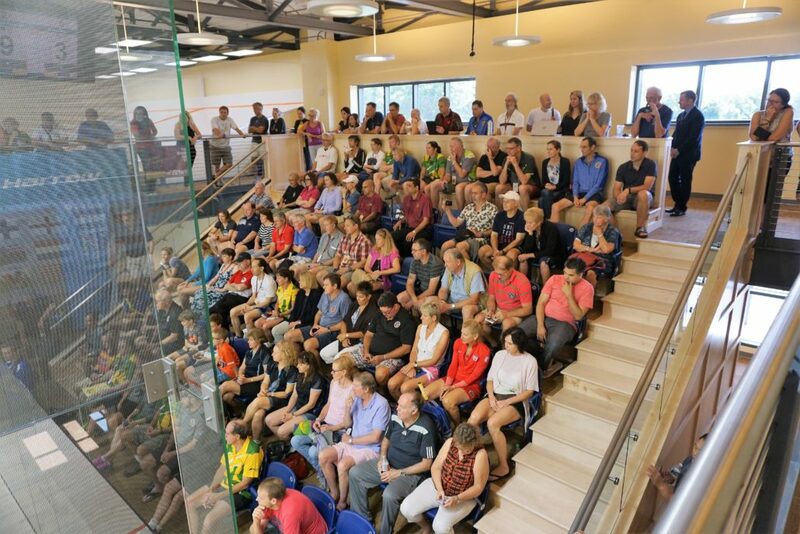 https://www.scottishsquash.org/wp-content/uploads/2018/08/FionaMcLean.jpg 3265 4898 Andy Weston https://www.scottishsquash.org/wp-content/uploads/2017/10/Scottish_Squash_Logo_LANDSCAPE-300x90.jpg Andy Weston2018-08-17 13:04:252018-08-17 13:06:10Hard work rewarded as Fiona McLean wins World Masters bronze.